Big four accounting firm Deloitte has waved goodbye to standard question and answer psychometric testing and developed a customised “game” which places potential graduate employees in real life work situations at the firm. The interactive assessment was developed by Deloitte and Talent and the professional services firm claims it’s the first of its type in the country. Deloitte national talent acquisition and mobility director Tanyth Lloyd said it would yield more accurate results than the generic question and answer tests. “Gamification is a really effective way of testing people. If you can make it fun and apply gaming principles, you get more accurate outcomes because people forget that they’re being tested and stop trying to predict the outcome,” she said. The new assessment takes 20 minutes to complete and aims to test an applicant’s problem-solving capabilities. It incorporates videos and tasks from real Deloitte employees, based on situations which regularly occur in their work environment. It’s being used for the first time by current graduate program applicants, of which 500 will be successful nationwide, but Ms Lloyd said Deloitte was also considering developing similar assessments for job seekers at other stages of their career. “Our vacationers (interns who work over holiday periods) will also use this … it is limited to this audience for now, but now we have a solution that is customised for our work environment, we’re looking at the viability of extending it,” she said. Fellow big four accounting firm KPMG was the first of the major professional services firms to implement this form of testing in Australia last year. At the time, KPMG said the new testing provided a 79 percent reduction in applications that had to be individually reviewed and a 58 per cent reduction in the numbers who go through to final interview sessions. PwC in Hungary has also jumped on the trend, creating a game called Multipoly which gives job seekers tasks around the skills the firm is trying to develop – digital competency, business acumen and relational skills. 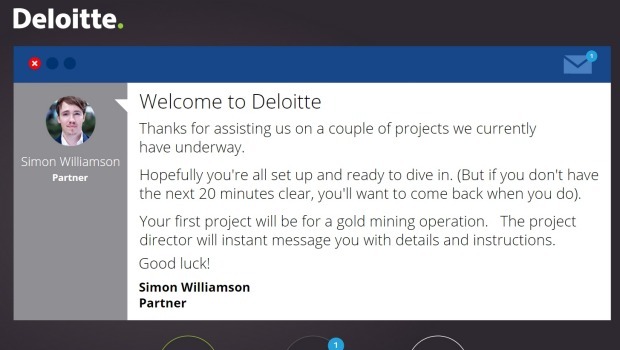 Deloitte in New Zealand has also created a customised game assessment simulating an employee’s first day in the office. Ms Lloyd would not reveal how much it spent developing the assessment, but said it was around the cost of off-the-shelf psychometric tests. To ensure that the customised solution is more effective, Deloitte intends to monitor the performance of the new employees and compare them to older employees who were employed based on older methods. “The data we’re getting is so much better than what we had previously and we hope it will let us make better-recruiting decisions,” Ms Lloyd said.